Wine Tourism Conference goes national! I’m still catching up and formulating my thoughts about the Wine Bloggers Conference, but as I do so, I thought I’d share with you another conference that I’m excited about. Ok actually two conferences! 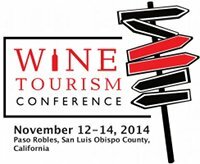 First, in November, I will be attending the Second Annual Wine Tourism Conference, here on my home turf of Santa Rosa. Last year, 200+ wine tourism professionals, bloggers, and media attended the first conference in Napa. Due to popular demand the conference is now an annual event, run by our friends at Zephyr Adventures (the folks that brought us the WBC). The Wine Tourism Conference (WineTC) was created, inspired (at least in my opinion and observation) by the International Wine Tourism Conference, to provide hard information about the important and growing industry of wine tourism in your region, as well as the region that conference is held in. Spawned by the International Wine Tourism Conference (more on that below), the WineTC attracts wineries, wine tourism professionals, wine associations, tour operators, travel agencies, hotels, PR professionals and media who writes about wine and tourism. Please follow on twitter using the hashtag #winetourismconference for all the lastest news! the event will take me to Zagreb, Croatia! I can’t tell you how excited I am to learn about the area and some of the wines of the region. I look forward to spending a few extra days exploring the region; after all, Croatia is the birthplace of zinfandel. You may remember that in 2011 I travelled to Porto, Portugal to speak at the IWINETC on topics of engaging bloggers (view my slides). This time, I will be teaming up with my friend and fellow blogger Liza Swift of Brix Chicks to discuss new ways of attracting wine tourists to your hidden gem of a region. The 2013 IWINETC will bring together wine and travel lovers and professionals from around the world to discuss, reflect on and develop their ideas on wine and culinary tourism. With two days of interactive presentations, demonstartions, and talks, it will also give attendees the opportunity to taste wines fro all over the world, and foucs on the host region of Croatia. With so many attendees from so many areas, there will be the opportunity to taste many different wines and foods. Much like the WBC, the IWINETC has grown over the last 4 yeras. In 2011, there wre 175 attendees; 2013 will bring 300+ attendees from over 30 countries. It will be a unique experience to share, network, and discuss wine tourism and I look forward to sharing more as we get closer to the date! Please follow along on twitter using the hashtag #iwinetc during the events! Both events promise to provide an overview of local wine tourism s well as wine tourism as a while, while providing specific information that you can use, networking opportunities, and a sampling of local wine and food. Stay tuned on more about Croatia and wine tourism in the coming weeks (and months)! Are wine bloggers and writers influential? Should we be?